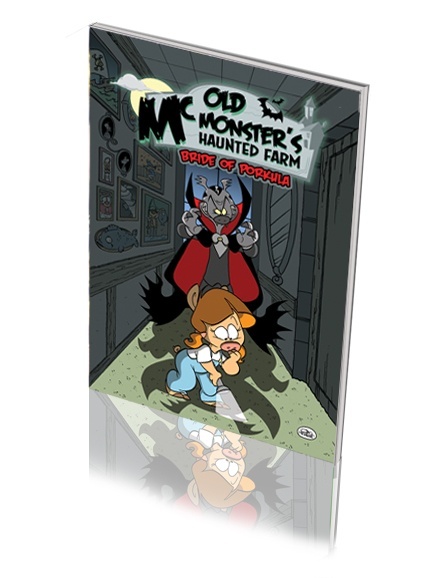 Look, it’s probably better if we just let the creators describe this one: “Virginia Hamm along with friends Herford Bovis and Bill E. Goat travel to Porksilvania to claim the estate of her late uncle, Otto McMonster. Little does our trio know that they must survive the likes of Count Porkula, Beefenstein, Mr. Gruff and a host of other ghosts and ghouls to bring home the bacon!” Got it? Old McMonster’s Haunted Farm was created by Brent E. Erwin, and this first full-color 48-page graphic novel in the series, Bride of Porkula, was written and illustrated by Jay Fosgitt. Ape Entertainment will be releasing it on the world this October — and if none of this makes sense to you, then check out the preview on their web site. Blah! Blah!